The United Arab Emirates (UAE) comprises seven member states: Abu Dhabi (the capital), Dubai, Sharjah, Ajman, Umm Al Qaiwain, Ras Al Khaimah and Fujairah. The total area of the country is approximately 83,600 square kilometres located on the eastern coast of the Arabian peninsula in the south west corner of the Arabian Gulf. Dubai is the second largest Emirate and is situated on the banks of the Dubai Creek, a natural inlet from the Gulf that divides the city into the Deira district to its north, and Bur Dubai on its south. The city ranks as the UAE’s most important port and commercial centre. The Supreme Council of the UAE, comprising the rulers of the seven Emirates is the highest federal authority. It is responsible for general policy matters involving communications, education, defence, foreign affairs and development and for ratifying federal laws. The UAE became a member of the United Nations and the Arab league in 1971. It is a member of the International Monetary Fund, the Organization of Petroleum Exporting Countries, World Trade Organization and other international and Arab organizations. The official language is Arabic, although English, Urdu and Hindi are widely spoken. Arabic and English are the official business languages. The non-oil sector of the economy currently contributes some 80% of the total produced domestic products of Dubai and is continuing to expand in importance. 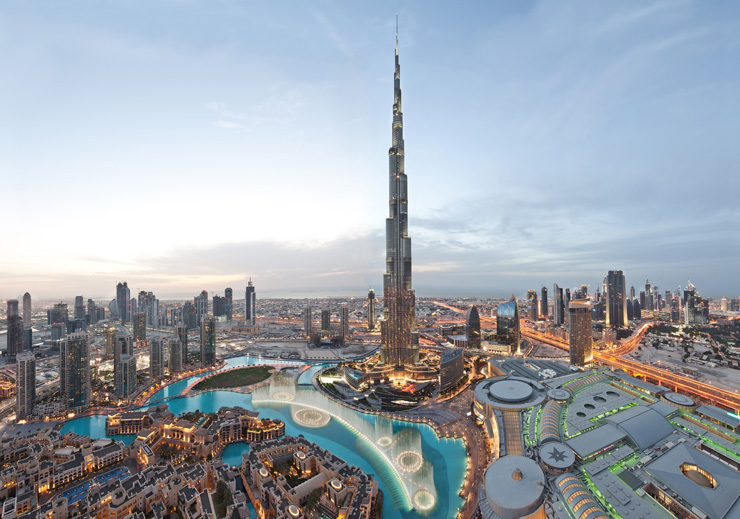 A long trading tradition has earned Dubai the reputation within the Middle East as the ‘City of Merchants’ and this remains an important consideration for foreign companies looking at opportunities in the region today. The UAE has concluded advantageous tax treaties with China, Czech Republic, Egypt, Finland, France, Germany, India, Indonesia, Italy, Malaysia, Netherlands (air transport), Pakistan, Poland, Romania, Singapore, Sri Lanka (air transport), Switzerland (air transport), UK (transport). It should be noted that the UAE is not on the OECD, UN or EU blacklists so Companies incorporated in this jurisdiction, if carefully structured with professional advice, may be extremely useful for tax planning purposes. There are a number of different ways of creating an establishment in Dubai, depending upon the function to be carried out. A Limited Liability Company is the most common way of registering in Dubai and is recommended where the purpose of the entity is to make sales within the region. It should be noted, however, that 100% foreign ownership of such an entity is not permitted. A professional licence will enable the provision of professional services, while a branch or representative office will be suitable where there is no requirement to actually conduct sales or manufacturing, only to provide information and negotiate sales. This type of company allows for a joint venture between national and foreign partners. Non-national partners are permitted to hold shares not exceeding 49% of the capital, with the national partner holding the remaining 51%. The law provides that the minimum share capital required is AED 300,000 (US$ 81,750). Share capital must be fully paid up and deposited with a local bank (can be transferred out once the company is registered). The shares of such companies are not open for subscription by the public. Despite the split in shareholdings, profits may be divided in other ratios agreed upon taking into consideration efforts of non national partners in management, provision of technology or expertise. The expatriate partner may undertake management of the company. It is possible to apply for a professional licence as a means to providing a professional service in Dubai. This involves issuing a licence in the name of an individual who must hold a relevant professional qualification. A UAE resident must be appointed as a service agent whose role is to facilitate visa applications and other administrative issues. Normally the local agent will be paid an agreed lump sum which is subject to negotiation but will be a minimum of US$ 7,500 per annum and may be considerably larger depending on the standing of the local involved. Foreign companies may establish a branch or representative office in the UAE. Branches and representative offices may, subject to obtaining the necessary licences, carry out promotional activities and facilitate contracts but cannot sell or manufacture goods locally. As described above, a UAE resident must be appointed as a service agent. Please note it is a requirement that the parent company is well established, usually with the ability to present at least 2 years worth of audited accounts. The UAE now boasts many free zones including Jebel Ali Free Zone (which was the first), Dubai International Airport Free Zone, Dubai Internet City, Dubai Media City, Sharjah Airport International Free Zone, Ajman Free Zone and Ras Al Khaimah Free Trade Zone. The main attraction of establishing an entity in one of the free zones is that there is no UAE national shareholding requirement. Once a company has been accepted into a free zone it will typically operate under one or more of four different licences being commercial licence, general trading licence, industrial licence and service licence. Free zone registrations do not require a local sponsor. Companies registered in the free zones have to pay 5% duty and appoint a local service agent if they wish to sell goods or services within the Emirates. Overseas sales are free of any duty.